As Earthmama Farms is a Non-Profit run by volunteers, Get Growing is our annual fundraiser through which we raise the money that we need to run our programs. 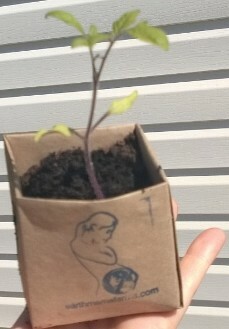 The program features low cost starter vegetable plants available for purchase for $1.00. All Get Growing plants are grown in biodegradeable hand-folded paper plant boxes lovingly hand folded by our faithful Earthmama volunteers. Each one contains a mix of Silverthorne's mushroom compost and Black Earth Topsoil. Planting instructions are simple - to avoid root damage during transplanting, thoroughly soak your biodegradeable plant pot and put it directly into the ground, a pot, or a container garden. Then water well! The worms in the soil will break up the paper pot, leaving behind waste that fertilizes your soil as your plant's roots feed directly on the nourishing compost you have burried with them. Remeber - for best results, transplant on a cloudy day or during cool weather as the hot sun will be draining on the new transplant. -King of the North Bell Pepper - Early, sweet Bell Pepper. Pick while green or leave on the vine until Red. -Jalepeno Pepper - A medium-hot Jalepeno which is flavorful when green or red. - SOLD OUT! -Genovese Basil - A hearty herb with many culinary uses. Enjoy fresh in salads and pestos or dry and use all winter. Antohi Romanian Sweet Pepper - Tasty frying peppers that start off yellow and ripen to red. Sweet flavour, early ripener.